NHL Stadium Series: Toews’ Blackhawks Destroy Snowy Penguins 5-1. NHL: Flyers Defeat Rangers 4-2 As The Race For Second Place In The Metropolitan. England take on France in Paris today and have selected a young, quick and dynamic team. The big news is that Jack Nowell will be making his debut alongside centre Luther Burrell in the Stade de France battle, a tough challenge for both players. The selection of Nowell will add pace on the wing with a back-line already bursting with speed if a little inexperienced. Outside of Care, Farrell and Brown, England’s backs only have nine test match caps. England clearly show their attacking intent, with starts for Harlequins Danny Care at scrum-half and Mike Brown at full-back. Both players will run the ball at any chance and give England the opportunity to terrorise the French backs with their quick off-loading style of play, one that Captain Robshaw likes to play. Care’s selection over Youngs will see England run the ball with the view to retaining possession, rather than kicking for territory. This has been something I have wanted to see England do for a long time and applaud the intention to play positive rugby, something that will help in the forth coming Rugby World Cup. The forwards should not be missed out of the selection analysis with Marler, Lawes, Robshaw and Vunipola all very attacking forwards who will carry the ball through the middle of the pitch. This will create space for the backs as France will need to commit men to the ruck, in order to stop the dynamic forwards. Head coach Stuart Lancaster bold selection is a risk, despite his claims this week otherwise. A risk that could pay huge dividends to the head-coach if England manage to get the win. Stuart Lancaster has stated he is going with his gut instinct, something that as a head-coach is admirable, over taking the safe option. A tough start for England, we all know that a win today is essential in order to carry momentum to the rest of the tournament. France struggled in last years Six Nations but can never be underestimated, as their streaky form can evolve into a rugby powerhouse, if they can get of to a good start. A win against England will be seen as a catalyst for confidence in the French squad, a potential danger for opponents to come. England have won six of their last seven against France and will need to carry that form into today’s game if they are to win. If they can get a fluid game rolling and dictate the play, England have a very good chance of coming back from Paris with a win. France: 15 Dulin 14 Huget, 13 Bastareaud, 12 Fofana, 11 Medard 10 Plisson, 9 Doussain; 1 Domingo, 2 Kayser, 3 Mas, 4 Flanquart, 5 Pape (capt), 6 Nyanga, 7 Le Roux, 8 Picamoles. Replacements: 16 Szarzewski, 17 Forestier, 18 Slimani, 19 Maestri, 20 Burban, 21 Chouly, 22 Machenaud, 23 Fickou. England: 15 Brown, 14 Nowell, 13 Burrell, 12 Twelvetrees, 11 May, 10 Farrell, 9 Care; 1 Marler, 2 Hartley, 3 Cole, 4 Launchbury, 5 Lawes, 6 Wood, 7 Robshaw (capt), 8 Vunipola. Replacements: 16 Youngs, 17 Vunipola, 18 Thomas, 19 Attwood, 20 Morgan, 21 Dickson, 22 Barritt, 23 Goode. Great full analysis of the comeback of one of the greatest and most controversial hockey players! Am I crazy or is Timmy T starting to look like himself again? The Philadelphia Flyers will need to use their excellent home form as a catalyst to being more consistent on the road. Nine straight home wins in a row has helped the Flyers into the third playoff spot in the Metropolitan Division. In order to stay there they will have to be more consistent on the road, starting with Edmonton tonight. If we take a look at the six games the Flyers will play on this road trip they need to win three from six to meet Berube’s minimum expectation for the team. Personally out of the six games Edmonton, Calgary and New Jersey seem the three to target, with Vancouver, Colorado and Phoenix also to play. I believe all six games are winnable and although it would be a big ask to win all six, the Flyers should win at least three. 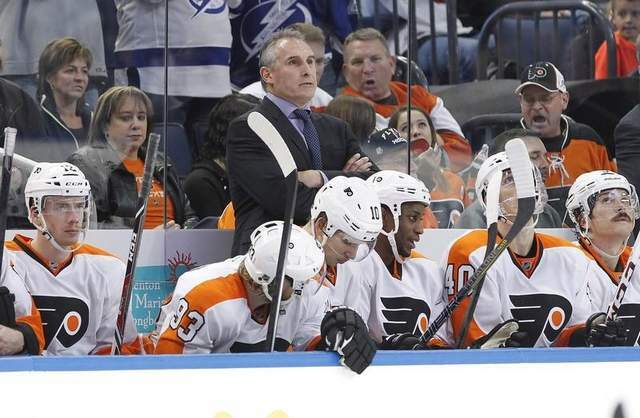 No games will be easy and the Flyers need to find a way to make them hard to beat outside of the Wells Fargo. Edmonton have won their last two games against Winnipeg and Calgary, snapping a six game loosing streak. If they can take the home form to the road then the Flyers can help establish themselves in a playoff spot. What the fans would like to see is their team turn up for all three periods each game. A lack of concentration or effort on the road is not good enough to get you into the playoffs. Let’s hope that the Flyers have come to understand that too!